The major downfall of the cryptocurrency market does not seem to end anytime soon and continues to disappoint the hodlers. The past one hour saw a slight upward moment in the price, however, the bears took the control back. The 7-days chart of the market is still bleeding red with Bitcoin Cash [BCH] being the biggest loser in the top 5 cryptocurrencies with 29.47% loss. 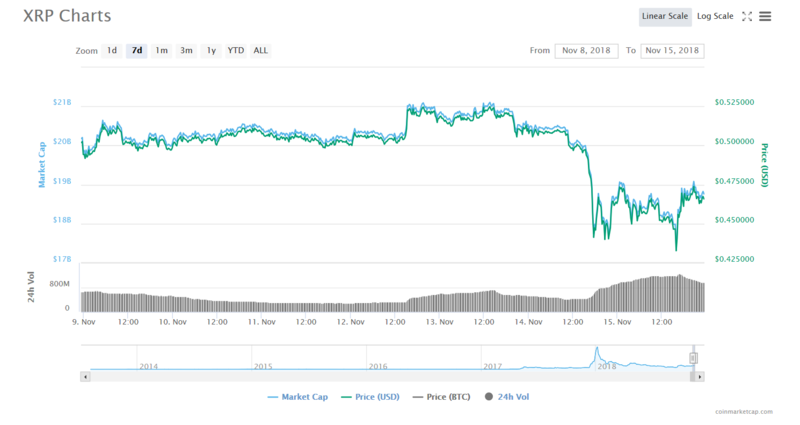 The total market capitalization of the market has taken a steep fall from $202 billion to $182 billion in less than 24-hours. It is being noticed that some of the coins are gaining the upward momentum in the 24-hour statistics, which includes XRP, Stellar [XLM], EOS, Litecoin [LTC] etc. The crypto community received an awakening call earlier today when XRP surpassed Ethereum [ETH] to secure the 2nd position based on market capitalization. At the time of writing, XRP is trading at $0.46 with a market cap of $18. 7 billion. The cryptocurrency has surged by 2% in the past 24 hours. The highest volume of XRP is emerging from a community-based exchange platform named ZB Global, which is followed by Bitbank. Along with other cryptocurrencies, XRP also showed the downside correction in the past two days. XRP was trading at $0.517 before the bear market began and it reached $0.43 in less than 24 hours. However, the price started gaining its momentum soon and reached the current point. The XRP community continues to express their positive reviews on the growth of the cryptocurrency on various platforms. The post XRP stays strong at the 2nd position while the crypto market continues its bearish journey appeared first on AMBCrypto.